Scouting in East of England is about Scouting in the official region of East of England. It is largely represented by the Scout Association of the United Kingdom and some Groups of traditional Scouting including the Baden-Powell Scouts' Association. There are two student associations at various universities in the region, each of which is affiliated to the Student Scout and Guide Organisation (SSAGO). These are Cambridge University Scout and Guide Club and University of East Anglia SSAGO. The 1st Bury St Edmunds Scout Group holds a registration certificate dated to 5 February, 1908, and the Group claims to be the oldest surviving Scout Group in England. However, this claim is not currently upheld by The Scout Association. 1st Southwold Scout Group was established in 1908 and claims to be the first Scout group established in Suffolk. 1st Reydon and 1st Wrentham in Suffolk also existed in 1908. In Norfolk, 1st Norwich Sea Scouts and 1st Dereham Scout Group both claim to have been founded in 1908, making them some of the earliest Scout groups to have formed. The 21st World Scout Jamboree, celebrating 100 years of Scouting, was held at Chelmsford in Essex between 27 July and 8 August 2007. Bedfordshire Scout County is a Scout County of the Scout Association of the United Kingdom. It is concurrent with the political county of Bedfordshire, and provides Scouting opportunities for young people and adults in the area around Bedford, Luton, and Dunstable. The badge worn by members of the Bedfordshire Scout County shows a red falcon on a yellow background. The current version of the badge was phased in over a ten year period, starting in the early 1980s. It replaced a previous version which had either a silver or gold falcon on a green background. The County is currently divided into nine Scout Districts. Cambridgeshire Scout County is a Scout County of the Scout Association of the United Kingdom. It is concurrent with the political county of Cambridgeshire, and provides Scouting opportunities for young people and adults in the area. Scouts in Peterborough were given the Freedom of the City in April 2007. This is the first occasion in Britain when Scouts have received this type of award. The badge worn by members of the Cambridgeshire Scout County is unusual in its design, as it is shaped as a shield rather than the more standard rectangle. The elements on the badge represent towns covered by the Scout County, the cross-keys representing Peterborough. In 2006 the Cambridgeshire Jamboree moved from the East of England Showground, in Peterborough, to the Huntingdon Racecourse. CamJam 2006 was the fifth such jamboree to be arranged by Cambridgeshire Scout County. On site activities included go-karts, a skate park, ice rink, a planetarium, climbing walls, radio controlled cars, caving and hot air balloons on two evenings. Other activities included archery, rifle shooting, model land yachts, car mechanics, scavenger hunt and model aircraft. Essex Scout County is a Scout County of the the Scout Association in the United Kingdom. Chelmsford in Essex was the location for the 21st World Scout Jamboree, held between the 27th July to 8 August 2007. The Chelmsford District had a number of special events. By 2007 there were 16,000 members in Essex Scouting covering every community in the county. The County HQ is at the Thriftwood Training Centre. There is an Essex Scout County Caving Team to train Scouts in Caving. The badge worn by members of the Essex Scout County shows the heraldry of the regional county of Essex of "Gules three Seaxes fessewise in pale Argent pomels and hilts Or points to the sinister and cutting edges upwards.". The Essex International Jamboree was first held in 1927 when it was visited by the Founder, and then Chief Scout, Sir Robert Baden-Powell. Essex have held jamborees every four years since 1952 and at their current site, Devereux Farm, Kirby-le-Soken, since 1996. Between 26 July and 2 August 2008, thousands of Scouts and Guides from Essex and beyond attended the Essex International Jamboree 2008. Over 8,000 participants and 2,000 staff attended the jamboree representing 30 different countries, including: Canada, Denmark, Egypt, Finland, Germany, Ghana, Gibraltar, Ireland, Israel, Kenya, Nigeria, Norway, Pakistan, Palestinian Territories, Romania, Spain, Sweden, Turkey, Uganda, UK, USA and Zimbabwe. Another 4,000 people, including hundreds of Cub Scouts and Brownies were hosted for the jamboree open day. The theme for 2008 was "The World's Endangered Animals" and included a strong emphasis for 'green issues' such as recycling and developing global links. In keeping with the theme, the site was sub-divided in to 10 sub-camps containing a mixture of UK and international Scouts and Guides, with a further sub-camp for staff. Each of the participant sub-camps was named after an animal that is at danger in the world. All of the animals could be found at the nearby Colchester Zoo, and each sub-camp became involved in the zoo’s adoption scheme as a lasting legacy of the event. The next Essex International Jamboree is due to take place in 2012. Hertfordshire Scout County is a Scout County of the Scout Association in the United Kingdom covering the County of Hertfordshire. The badge worn by members of the Hertfordshire Scout County shows a hart on a blue background, which is based on the heraldry of the regional county of Hertfordshire. Herts Peak Assault is a navigational and teamwork challenge for Explorer and Network Scouts, held at a different location each year. Groups must navigate their way around, visiting 'checkpoints' within the given time limit. Norfolk Scout County is a Scout County of the Scout Association in the United Kingdom, covering the county of Norfolk. There is a Norfolk Scout Canoe Team. The badge worn by members of the Norfolk Scout County shows the shield crest from the heraldry of the regional county of Norfolk. The current version of the badge has a light green background, whilst earlier versions had been black. The 12th Norfolk International Jamboree (NorJam) was held at the Royal Norfolk Showground between Saturday 29 July and Saturday 5 August 2006. Around 5,000 participants and staff attended the jamboree representing 17 different countries, including: Austria, Australia, Denmark, UK, USA and Spain. Three Guides were presented with their Queen's Guide Award by the Chief Guide, Liz Burnley, during the camp. The Jamboree included a Christmas celebration, held on Thursday 3 August. Other activities included scuba diving, horse-riding and sailing. The theme for the 2006 Jamboree was "Around The World In Seven Days", with each sub-camp being named after a famous landmark, and the event included a strong emphasis on current issues such as recycling and developing global links. The Norfolk International Jamboree is held every four years, with the next one due to take place in 2010. Suffolk Scout County is a Scout County of the Scout Association of the United Kingdom. It is concurrent with the political county of Suffolk. The badge worn by members of the Suffolk Scout County shows a crown "enfiled by a pair of Arrows in saltire points downwards", which is an element from the heraldry of the regional county of Suffolk. The pierced crown relates to the martyrdom of Saint Edmund by the Danes in 849. 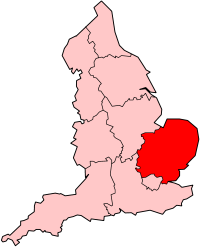 The East Anglia Area is part of the Baden-Powell Scout Association. The Association is represented in Norfolk by the Fakenham Lancaster B-P Air Scouts. The badge worn by members of the Baden-Powell Scouts East Anglia Area shows the arms of the Wuffingas Dynasty on a shield. The Wuffingas were the ruling family of the East Angles. Their last king was Saint Edmund, King and Martyr, who was murdered by the Vikings in 849 and was later canonised. The Pathfinder Scouts Association operates the 1st Bedfordshire Scout Troop at Houghton Regis, Bedfordshire, while the Rover Explorer Scout Association operates a Rover Crew in Lowestoft, Suffolk. The European Scout Federation (Fédération du Scoutisme Européen) operate in the East of England, with groups operating in Cambridgeshire. The British Boy Scouts operated Groups in Norfolk, including the 1st Norwich (St Marks) Group, although these were closed by 1999. The Bedfordshire Scout Association County has a large campsite and training centre, three District maintained campsites and three group maintained campsites. This campsite is near the village of Bromham, 4 miles (6.4 km) northwest of Bedford. There are 8 acres (32,000 m2) of open fields, and 18 acres (73,000 m2) of woodland on the site, offering a variety of camping locations. As well as the camping areas, there are a small number of buildings offering accommodation and training facilities. The site offers a number of activities, including pioneering, archery, and air rifle shooting. Boyd Campsite Campsite, Henlow, run by Biggleswade District. Jordans Close Campsite, Great Barford, run by Bedford District. Milton Bryan Campsite, Milton Bryan, Ampthill Rural District, run by Ampthill & Woburn District. Essex has several camp sites including:. Belchamps Scout Centre, managed by Castle Point, Crouch Valley, Southend Estuary and Southend West Scout Association Districts. Skreens Park. The Essex County Scout Council Campsite and Activity Centre, located five miles (8 km) west of the County Town of Chelmsford, consists of 52 acres (210,000 m2) of historic parkland which is part of the original Skreens Manor. It is located within 2 miles (3.2 km) of Hylands Park, the site of the 2005 European Scout Jamboree and the 21st World Scout Jamboree. The Site hosts GiGA Camp, the largest activity camp for Scouts and Girl Guides in South East England, with over 1,300 participants in 2006. Hertfordshire Scout Association County Scout Council is responsible for 7 Scout Activity Centres, including the Phasels Wood Scout Camp & Activity Centre, Tolmers Scout Camp & Activity Centre, Well End and Harmergreen Wood in Hertfordshire - along with Orchard Farm Wild Country Centre in Staffordshire, Lochearnhead Wild Country Centre in Scotland and Coetmor Mill Wild Country Centre in North Wales. All Hertfordshire Scout Association Activity Centres are members of the ASGC, the Association of Scout and Guide Centres. Eaton Vale Scout and Guide Activity Centre. Two Mile Bottom, Thetford Forest, operated by South West Norfolk District. Garvestone, operated by Central Norfolk District. An independent site, which has been used by both The Scout Association and the Baden-Powell Scouts' Association, is provided by the Mid-Norfolk Railway at County School railway station. There are a number of camp sites in Suffolk including Hallowtree Scout Camp, near Ipswich and Herringfleet Scout Campsite, Ashby. Cambridge Gang Show is an annual event organised by Cambridge District Scouts. Ipswich Scouts and Guides Gang Show. Southend Scout and Guide Gang Show. ↑ "The First Troops" (pdf). The Scout Association. August 2006. http://www.scoutbase.org.uk/library/hqdocs/facts/pdfs/fs295303.pdf. Retrieved 2007-02-21. ↑ Jamboree report, "Look and Learn"
This page was last edited on 10 October 2015, at 12:38.